The last major feast of the Christmas Season, in fact - the last day of the Christmas Season - is the Feast of the Baptism of the Lord. This feast is usually celebrated on the Sunday after Epiphany Sunday, except in years when the Epiphany is celebrated on January 7th or 8th. Then this feast is celebrated on the Monday after Epiphany. The baptism of Jesus is a significant event. Mark’s Gospel, the earliest Gospel written, begins with the preaching of John the Baptist and the Baptism of Jesus. In all three synoptic Gospels (Matthew, Mark and Luke), at the baptism of Jesus the spirit of God descends like a dove upon Jesus and a voice from heaven pronounces Jesus to be my beloved Son. In these three Gospels, it is immediately following Jesus’ baptism that he is tempted by Satan, and it is immediately after this temptation that Jesus begins his public ministry. in the form of a dove upon Jesus, Jesus calls his first disciples. And this is immediately followed by Jesus’ first miracle - changing water into wine at the wedding feast at Cana. 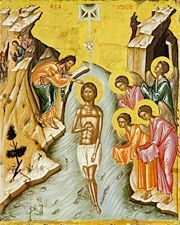 In our Roman Catholic Liturgical Calendar, while the Feast of the Baptism of the Lord is the final day of the Christmas Season, Orthodox Christians celebrate the Baptism of the Lord, or Theophany, on January 6th - the traditional date for Epiphany. The Blessing of Water is of great importance in the Orthodox Church on this day. Perhaps you recall seeing news coverage of young Greek men diving into the waters in places such as Tarpon Springs to retrieve the cross the Bishop has thrown into the water. 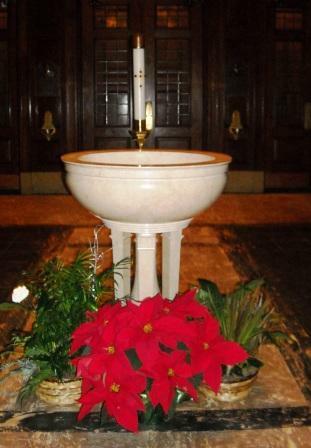 You can watch a brief video clip of an Orthodox Christian Blessing of Water Service below. The icon of the Baptism of Christ tells an interesting story. 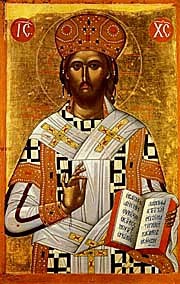 Notice that Christ is in the center of the icon. Everything revolves around him. He is standing in the Jordan River, his right hand extended in blessing. He is wearing a white loin cloth, his baptismal garment. Notice the motion of the water. Psalm 114:3 refers to the sea beholding and fleeing and the Jordan turning back. Water is life-giving, but the swirling, murky waters also are frightening and hold death. Christ descends into the waters conquering the evil lurking there. The icon is also very Trinitarian. Above Christ’s head you can see the Holy Spirit in the form of the dove, and above that at the top of the icon, the opening in the heavens where God descends. And note that from that opening there are three rays of light - three for the Trinity. In the icon, the mountains are singing the praises of God. May we do the same! We are baptized with water. Either we are immersed in the water, or it is poured over us. We recall our baptism with the sprinkling of water, and by blessing ourselves with holy water. As you celebrate the Feast of the Baptism of the Lord today, make sure to have a bowl of holy water as the centerpiece of your dinner table. Invite all the baptized sitting at the table to bless themselves with this holy water as part of your meal prayer. Sing Christmas carols for the last time this Christmas Season! in baptism that we are anointed priest, prophet and king. So as we come to the conclusion of this Christmas Season, let us celebrate not only Jesus’ baptism, but our own. And let us continue to remember and celebrate our baptism each and every day as we follow Jesus this new year. If you would like more information about the sacrament of baptism and Christian initiation, download our handouts below. 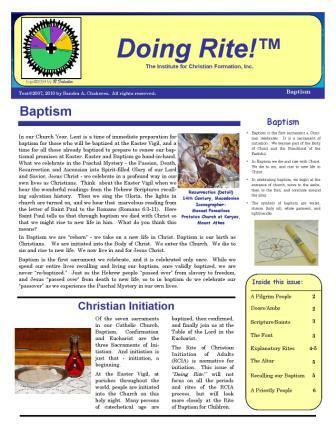 Click on image above to download our 6 page bulletin on baptism. 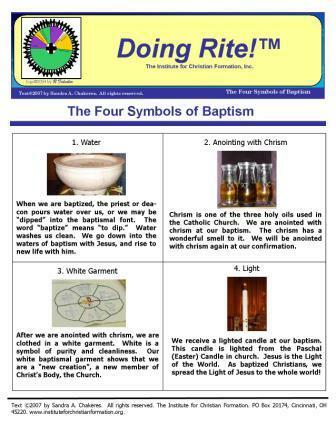 Click on image above to download our handout on the four symbols of baptism. 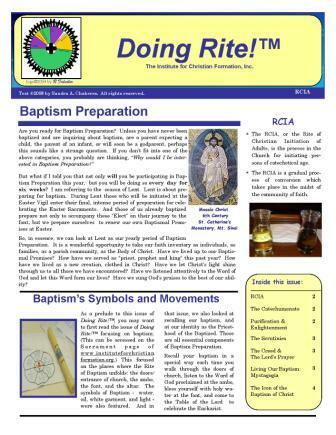 Click on image above to download our 4 page bulletin on the RCIA process.